HAS NOT BEEN AVAILABLE TO RENT AND WILL NOT BE FOR THE FORSEABLE FUTURE. TRYING TO HAVE THIS LISTING REMOVED. Situated in a rural setting, between the sea and village of Benissa - a historic town with its fabulous church and quaint village square and shops - near to Teulada, Calpe, Moraira and Javea. Bordering the Jalon Valley, which is famous for its wine making, where you can stock up on good quality wine from the local bodegas at extremely reasonable prices for the duration of your stay in between sun bathing round the pool or on the white sandy beaches with clear blue water all only 5 minutes away. 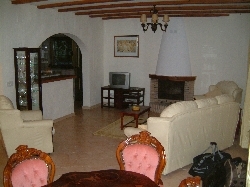 The villa is tastefully and luxuriously furnished and very very spacious. It is light and sunny having triple aspect and takes full advantage of the indescribable breathtaking and truly panoramic views of terracing, mountains, the Mediterranean sea and Calpe Rock. The villa is set in the exclusive La Vina area of high class villas and is ideal for those looking for a relaxing rural break away from, but easily accessible to, busy tourist areas and beautiful sandy beaches as well as many local villages and attractions. Benissa is a quiet Spanish village, but all major attractions are within 15-20 minutes drive. 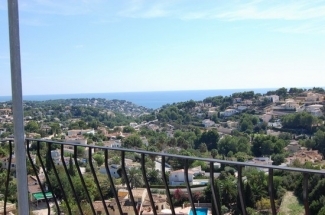 The nearest coast, which is viewed from the villa, is Benissa�s own beach at Fustera, which is only 7 minutes by car, the beaches at Calpe and Moraira are 10 minutes. These boast the most stunning Blue Flag sandy beaches (secluded bays with warm shallow water ideal for safe bathing, and beautiful, clean, golden sand), as well as night life with bars, fabulous but reasonably priced restaurants, discos, bowling and cinemas in the town. The villages of Benissa, Fustera and Teulada (7, 7 and 10 minutes) are nearby, where you will find supermarkets, bars, restaurants and train stations. Only a few miles away are the exclusive upmarket seaside resorts of Javea (15 minutes), Calpe (10 minutes), Denia (20 minutes), and also with Marinas as well as beaches - Altea (15 minutes) and Moraira (10 minutes). 35 miles away is Alicante Airport which takes 45 minutes to drive � one straight road. Benidorm is 20-25 minutes by car, where you will find a variety of nightlife, shows, clubs, hyper-markets, bars and restaurants as well as the theme park Terra Mitica, on the outskirts, which is Paramount Pictures answer to Disneyland, also Terra Natura, a wonderful zoo and water park � highly recommended for the children. This area is also host to Mundomar (animal and bird park) and Aqualandia (water park). This beautiful area boasts spectacular scenery, lovely blue flag beaches, historic and interesting towns and villages, with plenty of activities for families nearby. Three local golf courses range from standard to deluxe. There are also caves, horse riding, carting and numerous other activities and entertainment. The �local� is Bar Canis which is a 2 minute drive or 20 walk � it provides the most fabulous food and speciality tapas with good wine and very cheaply � this is where the locals go to eat. The local beaches are treasures � immaculately tended with lovely fine, clean, sand and washing/showering facilities and with plenty of places to eat on the promenades whilst soaking up the atmosphere. The water is clear, blue and warm � perfect for swimming and shallow and calm � making them a safe haven for children to enjoy the water � multilingual life-guards watch all the main beaches. There is parking for one car within the gates of the villa and plenty of parking outside on the deserted road. The property benefits from central heating (radiators) throughout which is ideal for those chilly spring evenings or for those wishing a winter retreat. The villa is divided in two apartments with balconies surrounding the entire villa. comprises one double bedroom with king sized wrought iron bed and one single bedroom with wrought iron bed - both beautifully presented with fitted wardrobes, dressing table and drawers etc. There is also a double futon in a recessed area of the huge lounge/diner. The lounge has 42" plasma TV with both British and European satellite channels, video/DVD film library, HiFi, PC with Broadband and a log burning fire place and comfy cream leather suite. 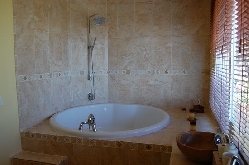 There is a beautiful marble bathroom with bath and shower, large basin, loo and mood lighting. 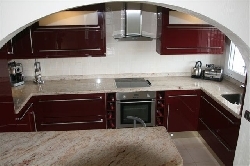 The kitchen is stunning contemporary sleek burgundy gloss with granite tops, chrome kick panels with star lighting to illuminate the floor, under pelmet and cabinet lighting, soft close drawers and pull out tap for washing salad. It is fully appointed with stainless steel accessories, fully integrated appliances, microwave, electric ceramic hob, oven, full sized fridge/freezer, dishwasher, toaster, coffee maker and grinder, griddle, kettle - basically everything one would find in a home kitchen right down to a juicer - with all those oranges an absolute must for your freshly squeezed oranges each day! There is a beautiful Italian dining suite to one end of the lounge and various patio and bistro sets on the balconies and round the pool for alfresco dining and both a brick built and gas BBQ and ceramic patio set on the pool side. has three large bedrooms each with their own �wow factor� en suites. The romantic master suite has a super-king sized cream leather sleigh bed and cream gloss bedroom furniture. The ensuite has a 6ft round bath in which you can soak with a glass of bubbly and from this raised bath you can see the wonderful view down to the sea through a huge arched window. It has with three modern and rain shower heads, his and hers round marble table top basins and an Italian loo and bidet. There is also a mirrored dressing table area. Double doors open into a partially covered balcony with soft furnishings in which to lounge whilst watching the sun go down into the sea over that last night cap! The second romantic bedroom has a king sized wrought iron four poster with or without satin sheets and solid Mexican pine furniture, again the patio doors open onto the veranda. This en-suite has a contemporary free standing bath on chrome legs, loo with soft close seat and his and her table top basins with view over the pool through a huge arched window. 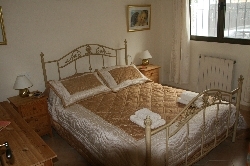 The third bedroom comprises 3 wrought iron single beds. The en-suite to this room has a fantastic wet room style glass waterfall shower and counter top glass basin with waterfall tap and loo with soft close seat. All bathrooms have heated towel rails and tiled flooring and the master has underfloor heating. Apart from the bathrooms the rest of this apartment has insulated laminate flooring. The living area is open plan comprising oak, leather and suede dining suite, HI-Fi and TV. The beautiful kitchen is as the top apartment but cream gloss, and there is a leather sofa bed. There is a laundry room with deep wash sink and washer/dryer off the kitchen. At the entrance to this apartment is a lovely naya with table and chairs and dresser which is a sun trap for breakfast and to watch the sun go down at night. is spectacular, and saline. It is 8m x 5m with a slide and there are plenty of eating areas on the various terraces. There are both traditional and gas BBQs and colour atmospheric lighting for evening dining and swimming. The villa is surrounded by planting on an automatic irrigation system. Please see our website for full details, extensive photo gallery, and links to placed to visit etc. 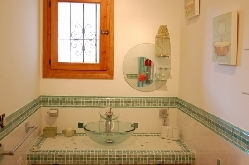 Above rates are the the rental of the whole villa (sleeps 13). Linen and cleaning included, and the services iof our multi lingual agent. Reduced rates are applicable for use of the separate apartments: Upper (sleeps 5)or lower (sleeps 8)or for reduced numbers of guests using the whole villa, so please see our website for details or email us. 15% Discount for all bookings for the whole villa of more than 7 days booked 3 months in advance. For less than 3 nights stay there is a supplement depending on length or stay and number of guests. We are only too happy to do mid week change overs to help with the cheap flight providers. Please do email or telephone and we would be happy to help with your needs and questions and negotiate a deal. Pool man comes twice a week in the summer and once in the winter. Local multi-lingual agent will meet our guests and direct you to the villa and be available during your stay.